25 million customers and still going strong! Look forward to taking your shake every day? Or mix with food for variation? Helps you feel full, satisfied and energetic. Provides dietary amino acids which the body cannot produce on its own. 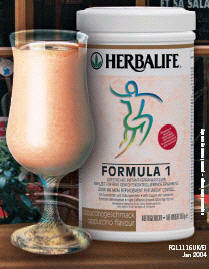 Formula 1 is a highly nutritious and satisfying meal replacement shake. Are you getting the right protein intake? So many different reports - Eat this, don't eat that, butter versus margarine, low-fat-no-fat, protein or carbohydrate - don't mix foods that fight, drink eight pints of water a day - or is that eight glasses? Eat your greens, avoid too much red meat, not too many eggs, the list goes on! Do you feel like screaming...cant decide who's right and who's wrong? Help is at hand-in the face of so much confusion, we have stunning solution for you. The body needs balanced nutrition to perform optimally. If you want to safely and comfortably control or maintain your weight, Formula 1 can help you to reach your goals with long-lasting results. Created with advanced food technology, this specially formulated meal replacements shake consists of a unique blend of ingredients provides easily absorbed, high-quality soy proteins, carbohydrates, vitamins, minerals and dietary fibres. You can be confident that every serving delivers, delicious satisfying, balanced nutrients. Variety! Something we need in all our daily diet. There are endless recipe ideas available to make sure the taste buds are tantalised. The last thing you will suffer from is boredom, as the recipes are so diverse and you'll have fun thinking up some of your own ideas! Provides a combination slow release carbohydrates (glycemic index 33) to help regulate blood sugar highs and lows while maintaining energy levels. Keep a can of Formula 1 in your food cupboard your body deserves the best. A very healthy snack for the rest of the family. And for those concerned about Cholesterol levels? The inclusion of at least 25g Soya protein per day as part a diet low in saturated fats can help reduce blood cholesterol. Two formula 1 shakes (vanilla) provide 17.8 g of soya protein(71% of the suggested intake of 25 g). An additional 7.2 grams may be obtained from other foods, such as soy plus a serving of Soy beans(10.6 g soya protein per 90g serving or Herbalifes Protein Supplement Powder (4.5g soya protein/6g serving) can provide over 25g of soya protein. Are you getting the right protein intake? Rich in minerals and vitamins, including the antioxidants Vitamins A and C, that can help fight free radical oxygen molecules and so help protect your body. What's in Formula 1? Boost the protein content of your shake with Herbalife Protein Drink Mix and take in water. How many calories in Formula 1? How do you take Formula 1? Blended with non-fat milk, soy milk or fruit juice to make a delicious shake. You can also create your own shake recipes by adding fruit. For prices and ordering please sign into the members web site. All weight loss claims refer to the Herbalife Weight Management Programme which includes, amongst other things, a balanced diet, regular exercise, an adequate daily fluid intake and appropriate rest. The products are not intended to diagnose, treat, cure or prevent any disease.